Most people on social media and especially those involved with cryptocurrency have been exposed in the past few weeks to a new digital currency project “Initiative Q” that hands out “free” money. It has been going viral, claims NOT to be a cryptocurrency but yet compares itself to Bitcoin 7 years ago. So what is it then? Is it legit? Is it a scam? And is it indeed going to compete with cryptocurrency or the legacy financial system? First of all: it doesn’t cost any money to join and they are not phishing for sensitive financial info or private keys so that makes the probability of it being a true scam at least significantly lower. The mentioned founders seem real and with a legitimate background: one is a serial entrepreneur that has in the past founded a payments security company that was bought by PayPal for which he worked 2 years as well. The other is a professor in monetary finance and also seems to have a reasonably scientific background in economic study. Their information is in the public and they have a decent background, so we are off to a good start. Last point: they do know about viral marketing, because their campaign went from nothing to insanely viral in a matter of just a few weeks. So what is their project about? They claim to be an experiment where they aim to implement a revolutionary modern payment network with its own native digital currency that should replace the legacy fiat system, while at the same time not being a cryptocurrency. They want to achieve mass adoption by distributing the largest part of their token supply for free through their massive invite-a-friend viral marketing campaign on social media. The system is not there yet and still needs to be developed, still they want to see first if enough people would adopt it. As they say: if enough buyers in the marketplace want to pay with the currency token and enough merchants wish to accept the token, then mass adoption will succeed automatically and the value of the token will be naturally established. According to their theory the value of any form of money, and thus of their currency as well, will come from the formula of monetary economic theory: MV=PT. This formula reflects that the larger the economy of a currency is, the higher the value (if the money supply and velocity remain stable). The formula MV=PT essentially says that the amount of currency units (“circulating supply”=M) multiplied by the number of times it changes hands (velocity=V) is equal to the price of goods and services produced (P) multiplied by the number of trades (transactions of buying/selling goods and services=T) made. So if the economy grows: P*T, and the supply of currency and velocity stay the same, by definition the value of each currency unit will grow. In economic theory this can’t really be disputed. However, the critical issue is of course that consumers and merchants must have trust in the stability and durability of the token and its related payment network – at least enough for merchants to start accepting payment in the Q-token. They want to initially distribute 2 trillion tokens, that they expect (by using the MV=PT formula), that on world-scale adoption, each token would become about $1 of value. How would the system look like? Their network will have all the latest and best technology for fast and efficient payments (their claim). Payments will be processed by local “Q Agents”, who will be the equivalent of banks. They will receive transaction fees to be incentivized to play this role. They will need to locally comply with financial regulations and have the proper licenses. The Q Company will develop and promote the network. A Monetary Committee consisting of financial experts will be voted in by the Q community. This committee will decide upon monetary policy by increasing the total available token supply only when the ecosystem grows, so that the value can be stabilized. Important note: Q aims to be a stable currency with an elastic supply (not fixed supply). Interesting note: the local agents will from time to time settle their balances through the internal network and they say that this could very well be done by using a “DISTRIBUTED BLOCKCHAIN LEDGER” – a “proof of authority” chain, similar to what Ripple does. 10% for the Monetary Committee that will in charge of monetary policy and will also gradually exchange the Q tokens for other assets that it will hold in order to perform their duty. 40% distribution for merchant incentive and adoption. They create a sense of exclusivity by making it invite only, so you need to obtain an invite link from someone you know that signed up before you. Use the link to signup by providing name + email address and you will receive like 10% of the tokens your entitled to. This amount decreases over time to create a sense of urgency and Fear of Missing Out (FOMO). Then you need to share with your friends (word of mouth marketing) to receive 40% more of the entitled amount. More promotional steps can be taken to reach 100% of the allotted amount. And then just wait for them to develop the whole project, which will take a couple of years for them to complete the process. In crypto the security risk is on the user, where in the legacy system banks take care of security. And crypto users (CURRENTLY) have to do all kinds of complicated security steps to handle private keys. While this is true and crypto might never be for really everyone for this reason, however this is an intentional feature of cryptocurrency: with more freedom and full control of your money also comes more responsibility. And user experience with regards to handling private keys is expected to improve in the future as well. Cryptocurrencies are unstable in value which makes them unsuitable as currencies, according to Q. While this is a legit criticism at current time and that most cryptocurrencies might never be as stable as fiat currencies are in the short term, still on larger volume scale the volatility might decrease enough to be more viable AND there are several experiments with stable coins that aim to achieve a stable value. The fact that cryptocurrencies are outside the legal framework they expect that they will have a hard time in the battle against governments. Though not entirely unwarranted, still more and more regulations are being introduced around cryptocurrencies and Bitcoin is even entering the regulated financial markets. Right now in fact cryptocurrencies are generally more accepted within legal frameworks than Q is. Q believes that the absence of reversibility is a negative aspect of cryptocurrency. People make mistakes and fraud should also be able to be reversed. According to them human intervention should always be possible. Most of cryptocurrency transactions are indeed CENSORSHIP RESISTANT which also makes them irreversible. This is a key aspect of (most) cryptocurrencies which provide a certain value for people who appreciate that characteristic. Fraud prevention can be achieved by using escrow services or multi signature transactions. Also, some crypto projects are being developed (like EOS) where reversibility even is a feature as well, so there is even that choice WITHIN the crypto space. Waste of electricity by Bitcoin for Proof of Work. Now this is an age old argument that most no-coiners (people that are against crypto) use. However this is a matter of opinion. Bitcoin indeed uses a lot of energy, however this is intended to secure the network against malicious attacks to be able to keep its core principles. For people that use Bitcoin, this is not a waste of energy – rather a valuable use of energy to secure a new and open financial system. So this argument is invalid as it is a matter of opinion of what someone finds a good use of energy or not. Appeal to FOMO by comparing it to getting into Bitcoin in the early years. Mentioning this is a typical tactic of scammers to get people to FOMO in. To be fair, they are transparent that in fact similar gains are impossible due to their structure: 2 trillion coins issued with the aim to become a stable coin of approximately $1 and the fact that this plan will take years to complete (which eliminates the get-rich-quick narrative), but the emotional appeal still is made by referencing it to Bitcoin in early days, which is obviously inaccurate. More FOMO is created by inciting a sense of urgency with the countdown of the value that one can earn as time goes by. A value that is completely hypothetical because it depends entirely on 1 Q actually becoming worth $1 ever in time. There is no concrete plan on how to achieve this technically nor any white-paper scientifically making the case, which means there is even less documentation than your average shady ICO. They use multi-level marketing (pyramid scheme tactics to grow their membership). This is generally a full stop red flag. However, in all honesty and as they point out, because pyramid schemes require payments and Q does not, this technically indeed does not fall under the category pyramid schemes, so this red flag doesn’t really count. Tell-a-friend marketing is more appropriate and this is a widely used and accepted marketing strategy. Currently it seems they don’t have significant funding (yet) and they are not planning to sell tokens soon for funding. However if they achieve their goals by getting enough members on their platform, they might find enough traction to be able to sell tokens at a “discount” (less than $1) to accredited investors to receive desired funding to be able to implement their roadmap. It’s free, so as long as you don’t mind sharing your name and an email address, it is not very likely to cause much harm or lose you any money. However we do encourage to use a separate email address that is not linked to any other service that you use. Their marketing is provenly excellent considering their viral campaign. If “Proof of Social Media” alone is going to be enough to derive value for this token is entirely another question though. Founders seem capable enough with relevant background. Seems like a totally centralized project and if they do implement blockchain technology, there isn’t much difference with some other existing cryptocurrency projects, since they implement a form of Proof of Authority. They are not that revolutionary at all, so they stand equal chances in competing with other cryptocurrencies, meaning they will face a hard time achieving a $2 trillion market cap. As they are centralized and have choking points, they are not any better than other companies that could get shut down easily by the government. They have no advantage over cryptocurrency at all on this aspect. By not being permission-less and censorship resistant, they lack important value propositions of Bitcoin. The existing technologies that they want to implement to modernize the payment system are most likely also going to be implemented by the traditional financial industry as well, so their advantage will likely disappear as well. A slight advantage would be that they are stable. Timeline is quite long, with not much going on in the meantime that would keep the members engaged for years before their coins become worth anything, while at the same time crypto keeps their community engaged exactly because of all the price action. Without having the core characteristics of true cryptocurrencies, it would become only an alternative for fiat currencies. However, it would not benefit from another aspect of fiat bank accounts: balances covered by insurance. So it would not have any of the advantages of either cryptocurrencies nor those of fiat currencies. The only minor advantage could be that its monetary policy MIGHT be less inflationary than fiat and more stable than crypto, but I am afraid that is not going to be enough to compete with either one of the systems. The Q company, by utilizing their marketing strategy is gathering an enormous database of people that are interested in easy money and that are willing to sign up and refer friends for it. This is of course a very valuable database and although there is the promise in the terms that data is not going to be sold and that the database will be destroyed if the company doesn’t succeed, still the data is on a centralized server that could always be compromised or the company as a whole (including database) could be sold. For the crypto community: the project takes a very definite stance against cryptocurrencies and Bitcoin, which is obviously a hostile action against anyone holding cryptocurrency. Signing up and referring friends means supporting an initiative designed against cryptocurrency. 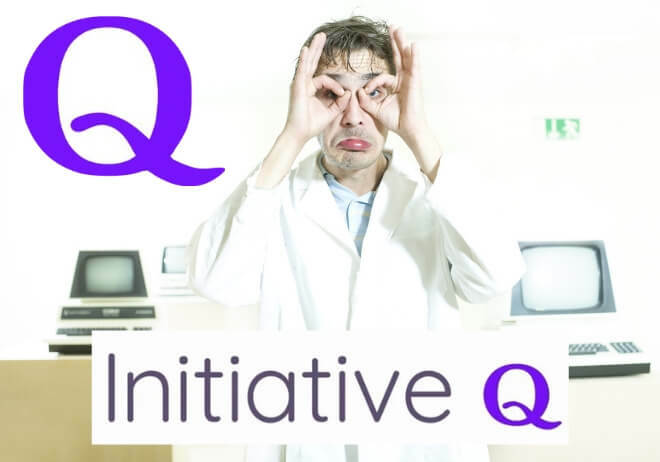 Final thoughts – Is Initiative Q a scam? To be honest: no, I don’t believe it is a scam in the strictest sense of the word, but I do categorize it as semi-shady considering its aggressive tactics exploiting on FOMO. And as a supporter of the cryptocurrency ecosystem I consider Initiative Q an opponent and therefore out of principal I won’t be signing up. Also, because I believe the chance of this project succeeding in its overly ambitious goals are almost negligible, I am not the least worried about missing out on anything.